The passage of the Social Security Amendment Act introduced the Domestic Purposes Benefit (DPB) to New Zealand’s social welfare system. The DPB was intended to help women with a dependent child or children who had lost the support of a husband, or were inadequately supported by him. It was also available to unmarried mothers and their children, and to women who were living alone and caring for incapacitated relatives. While men could also claim the DPB, the vast majority of beneficiaries were women. A new and sometimes maligned category of New Zealander was created: the ‘solo mum’. 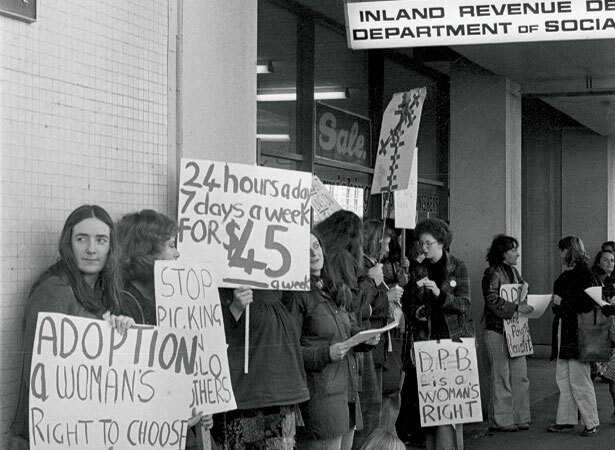 Controversy about the DPB intensified in 1976 when Minister of Social Welfare Bert Walker announced that some solo mothers were ‘ripping off the system’. Others argued that the DPB was an important right for women. It gave them and their children some protection from the potentially harmful consequences of failed relationships. Advocates also argued that as the amount paid was barely enough to cover basic necessities, it was hardly an incentive for anyone to choose to give up paid work. We have 15 biographies, 12 articles, related to DPB legislation enacted.